My name is Beth, and I'm a birdaholic. Which means I am addicted to birdahol. Haha. No theology in this one, guys. It’s reading week, and I’m on theological break. But thank you for helping me think through the last issue. Also, in case you were worried, still no sign of any of the late Melba’s possible relatives, and yes, I finished my paper, five minutes before the deadline. Yikes. There are a lot of people in my neighborhood who run. Usually they are grouped in packs. They wear spandex pants, and lightweight gore-tex coats of the highest quality. They have tiny water bottles strapped to them. Most of them look like they’re in deep distress. Others try to talk to each other. Sometimes when I see them coming in my direction, I look behind them to figure out what they’re running from, so as to decide whether or not I should be joining them as they flee. Or I look ahead to see where they’re so anxious to run to. Mostly, I think that running is silly. You miss out on everything there is to see. 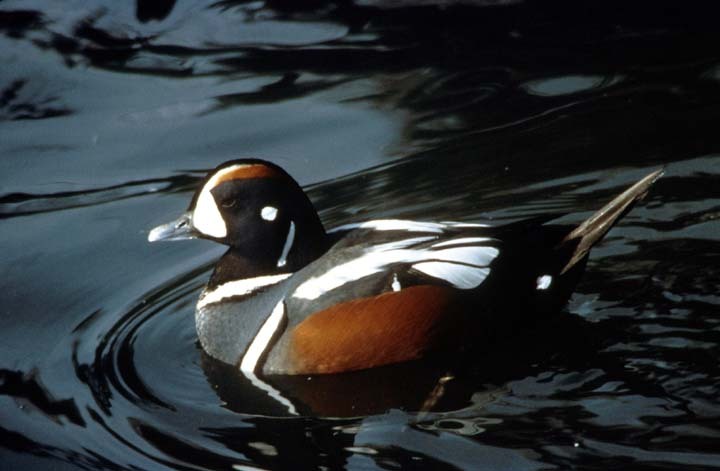 Such as harlequin ducks. I saw harlequin ducks from the Rock the other day, for the first time. They’re gorgeous. Here’s a picture I didn’t take. I call the ones at the Rock Brendon 1, 2, 3 and 4, thanks to a rumour I heard about a certain pastor who used to read harlequin romances. Also, two new bald eagles showed up, who Christine aptly named Lex (Luthor) and Sinead (O’Connor). Did you make the connection? And this morning, I met my first coot. The best thing about meeting a coot (yes, this is a duck-like creature) is that I knew it was a coot because of my ecology camp teaching last summer. 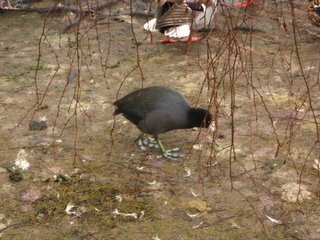 I remembered that coots have lobed toes instead of webbed feet. I actually held up a rubber coot foot on several occasions to teach the children about coots, though I had yet to see one. And now I’ve seen it. My eco camp boss would be so proud of me! Christine (who is obviously my bird namer) has suggested "Ya old" as an appropriate name for this coot, in honor of her grandmother's use of the saying "ya old coot". Check out the lobed toes in this picture I took. Today I realized that yes, I am, in fact, a bird geek. You may things such as those recorded in the last paragraph should have been enough to convince me, but we can be rather blind to ourselves sometimes. I only realized my own geekiness as I talked to another bird geek. She is an older British woman, and I drove with her to visit a Christian conservation center today. She said things like “blow me down if I didn’t spy a golden plover at the estuary last week” and spoke of the return of the snow geese as an “emotional, religious experience”. 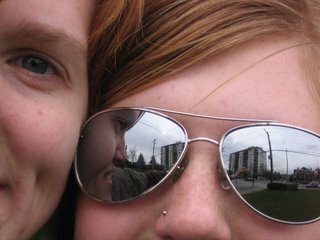 She convinced me to join the Vancouver Natural History Society (I thought they were about history, but apparently they’re about nature). I sent in my membership today. I think it will provide great geek catharsis – finally, I will meet more of my own kind. Now that I’ve lost half of my blog readers due to boredom, I think it’s time to get reading. It is reading week, after all. P.S. Tip to anyone who doesn’t have an oven, but still wants to enjoy muffins… they’re called muffin mix pancakes. Simply pour muffin mix in pancake-sized blobs in the frying pan. I remembered Andy Milton making them on a canoe trip once, and they’re to die for. Thank you, Andy.